Adding the hot grilled peach to the freshly minted soft serve blew the aesthetic, but since I like to slurp my ice cream anyway, I didn’t mind. 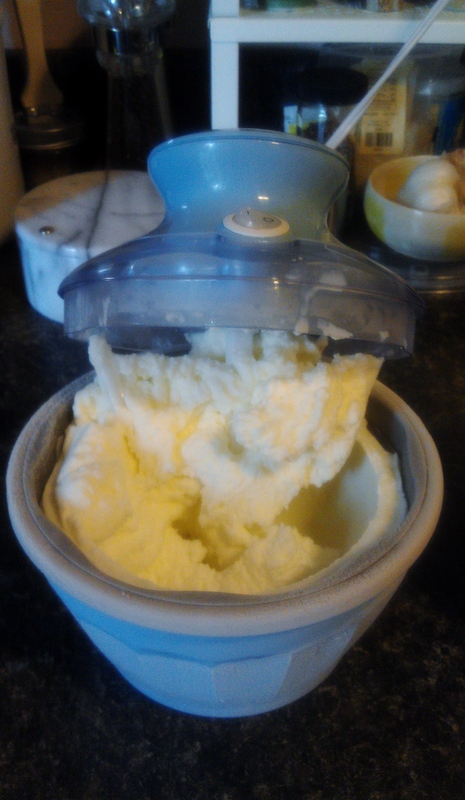 In my post “The Ice Cream Man Might Drive Me Crazy” I told you how much I’d love to make ice cream but just can’t cotton to having many quarts of ice cream in my freezer into perpetuity. Not only do I not have the freezer space (I still have cookies and rolls from last semester’s baking class and this semester’s baking class just started), it’s not good for you. So full of excuses! Rationalizations! 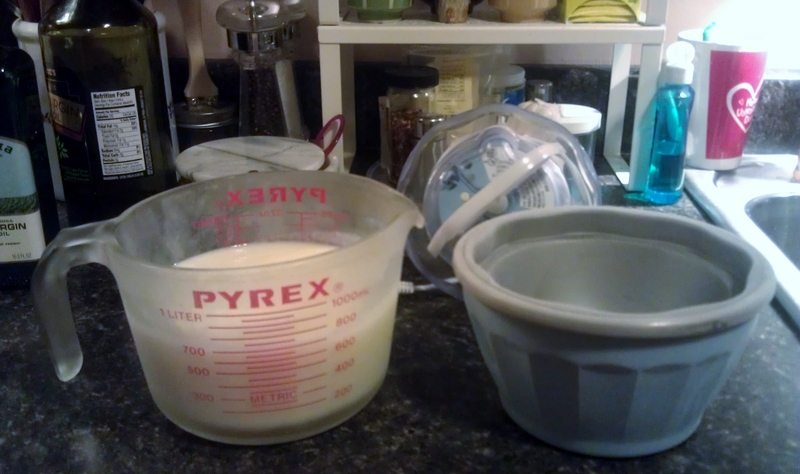 A true ice cream maker would buy a second freezer and churn away into the night like a mad creamery scientist, right? Well. Enter Fortune. I killed my oddly expensive Little Green carpet cleaner by letting my oh-so-natural vinegar-and-water solution (so superior to commercially scented products! so chemical free! so groovy!) sit in the tank. I had been vaguely wondering why my closet smelled like vinegar every time I went in there for something…it was because the vinegar — surprise! — had eaten away at all the rubber seals and gaskets and the bottom had basically fallen out of the contraption without my noticing. Don’t be surprised — this kind of thing is actually a routine occurrence for me. But, I’m trying to explain why I happened to alter my regular routine and found myself in a Super Goodwill looking for somebody else’s discarded handheld carpet spot cleaner — the whole other-people’s-trash-is-my-treasure sort of thing. 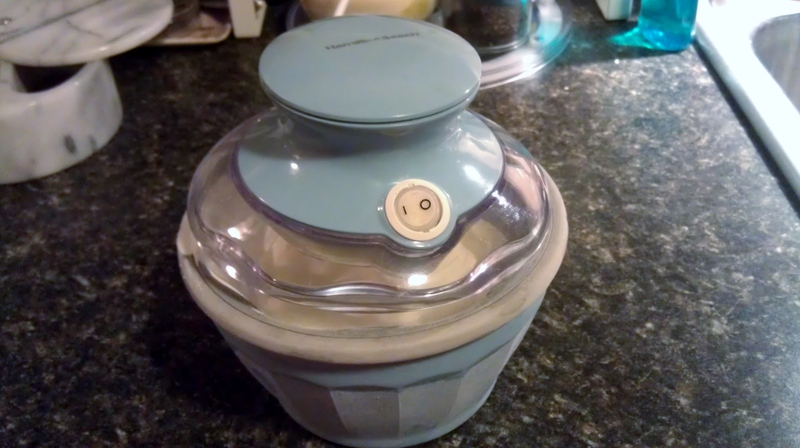 Naturally, I didn’t find one, but I did find a bitchin’ piece of vintage Tupperware (no, not the deviled egg keeper — La Fortune’s not THAT sweet) and this: the Hamilton Beach 1/2 pint ice cream maker. $3. Yippee! Imagine my delight. It’s on. 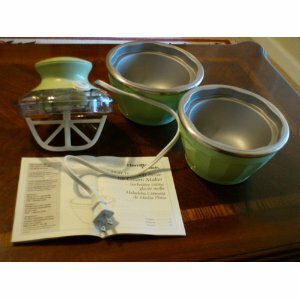 This one isn’t mine — mine is blue, is missing one bowl and the manual — but this is the Half Pint Ice Cream Maker in its Platonic form. And, can I tell you that right after that, no less than four ice cream recipes came my way via other food blogs? Coupled with the other half dozen ice cream recipes roosting in my inbox right now, I figured it was time. Just in time for autumn, when people tend to want ice cream the most, yes. First, I decided to make vanilla. Start at the beginning, right? Keep it simple? 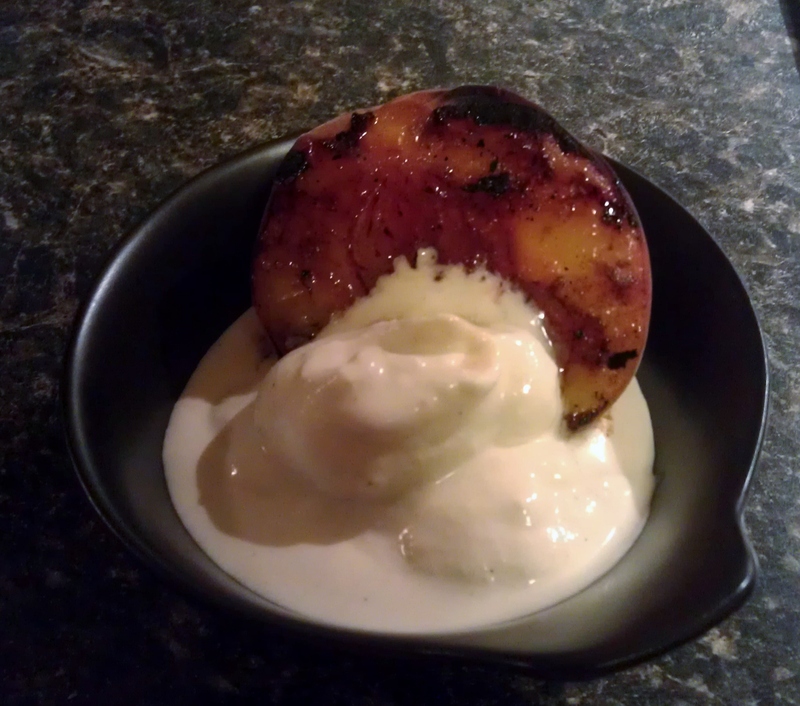 But then I decided to grill some peaches to go with it…and doesn’t honey go well with peaches? 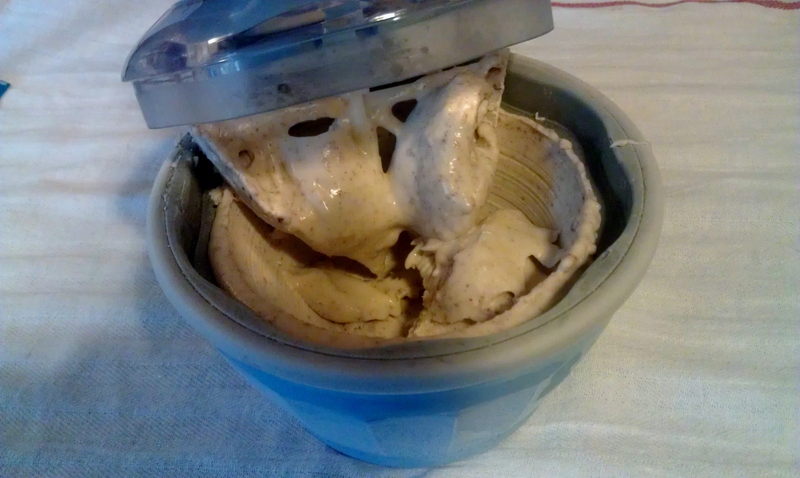 And don’t I just happen to have a recipe for Honey Ice Cream culled from the food blog The Way The Cookie Crumbles? Well, yes. So it was Honey Ice Cream — with some vanilla bean paste thrown in for good measure because I CAN’T JUST LEAVE IT ALONE — scaled down from y= 1 quart to y= 6 oz. 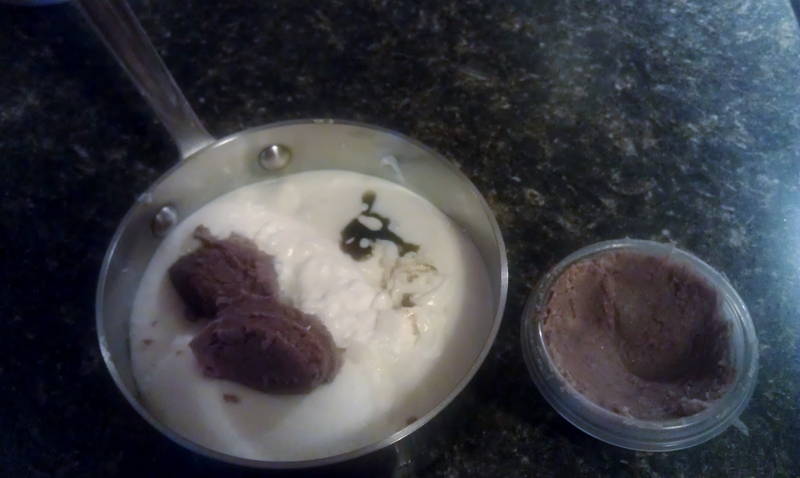 Prepping the little guy: cold ice cream base, frozen bowl. See how tiny he is?! My Lil’ Mini is ready to go. Next, I decided on Lemon Buttermilk Sorbet. I came across this recipe in the comments section of a website when I was searching for advice on my new Lil’ Mini. Since I was sans instruction manual, I was boning up on soft-serve strategies using the glorious inter-web. If you find yourself in possession of a Hamilton Beach Half Pint Soft Serve Ice Cream Maker and want some advice, click here. The recipe for Lemon Buttermilk Sorbet turns out to be from Epicurious.com (68 reviewers gave it an average of 4 forks). I had lemons and buttermilk on hand (doesn’t everyone? ), so this recipe proved to be a snap. Plus, I felt very virtuous since there wasn’t any cream in it. And, I love lemons. When I was feeling less virtuous, I decided to try Cooking Light’s version, which is, ironically, not as “light” as the recipe from Epicurious.com since it combines buttermilk with whole milk and half-and-half. Cream sure does make for the delicious, doesn’t it? 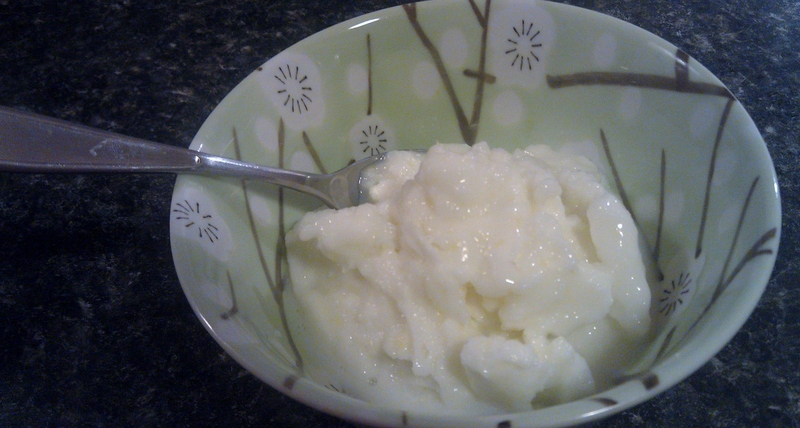 Buttermilk Sorbet, but with cream and milk. Does that mean it’s not sorbet? For my next trick, I chose something a little more exotic: Coconut Red Bean Ice Cream. I found this recipe on a blog called Butter is Beautiful. If you read my post “Cuckoo For Coconut!” you’ll remember I’m in a coconut phase, so you can see how coconut ice cream would intrigue me. This recipe also happens to be vegan, but shhhhh! or nobody will try it. The making of the Coconut Red bean Ice Cream. I made the red bean paste, on the right, a day or two ahead. It’s no sweat. This recipe involves coconut milk mixed together with red bean paste, which you can buy at an Asian market. Or, if you are already making red beans and rice since you have to use up the smoked pork you still have from your ham-buying frenzy earlier in the summer (see “The Aisle of Ham“), you can just set a portion of red beans aside after soaking and cook it off separately from the savory dish. Red bean paste is very easy to make. You can see its appearance in the photo above. Try it, except don’t put the red bean paste in the saucepan — that was a mistake — it actually gets stirred in after the concoction comes off the heat. It smelled extremely good in the making. Coconut Red Bean Ice Cream. It was exceptionally creamy and delightful. This ice cream may have been my favorite of the three only because it is a bit exotic. The coconut milk gives it a unique creaminess, and the red bean paste, while sweet, has an almost savory aspect to it. It’s a nice contrast. Plus, I liked the texture. 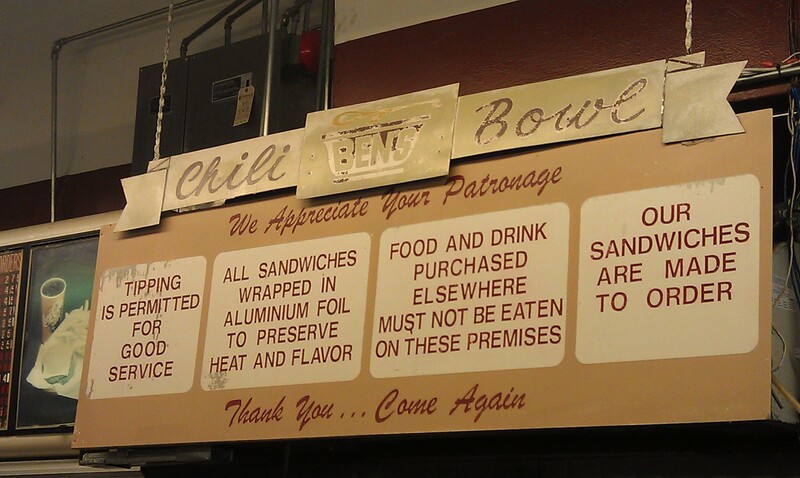 What’s So Great About Ben’s Chili Bowl? 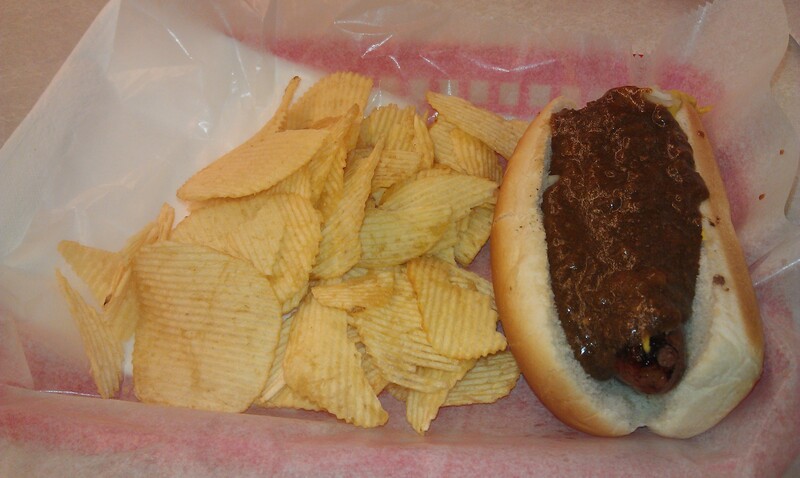 Ben’s Chili Bowl, a Washington, D.C. staple. There are certain places you grow up with that become frozen in time and space as favorites — even if they no longer deserve it. I found this out the hard way when my aunts came to visit me a few years ago in California. They arrived after dinner time and were hungry, but not in the mood for a meal. I knew just the place to take them. Ask anyone who grew up in Berkeley the abbreviated question, “Blondie’s or Fat Slice?” and they should, if they’re legit, answer you immediately. For me, it was always Blondie’s so I drove my aunts to Telegraph Avenue – and met the cliche, “My how the mighty have fallen.” Telegraph at 9:30 p.m. on a weeknight was empty and forbidding. When did it become so ratty? There was an active disagreement in progress between Berkeley Police and a homeless man on the sidewalk outside of Blondie’s, but we went in anyway and ordered our slices. I saw everything through the eyes of a visitor, one who hadn’t grown up here, hadn’t taken the bus here with high school friends on a Saturday night when being out of the house was exciting and the collective energy was pumped up. I’m sure my aunts were wondering why on earth I would bring them to this place as their entree to California’s sparkling reputation as all things vibrant and cool. It was a grim experience. 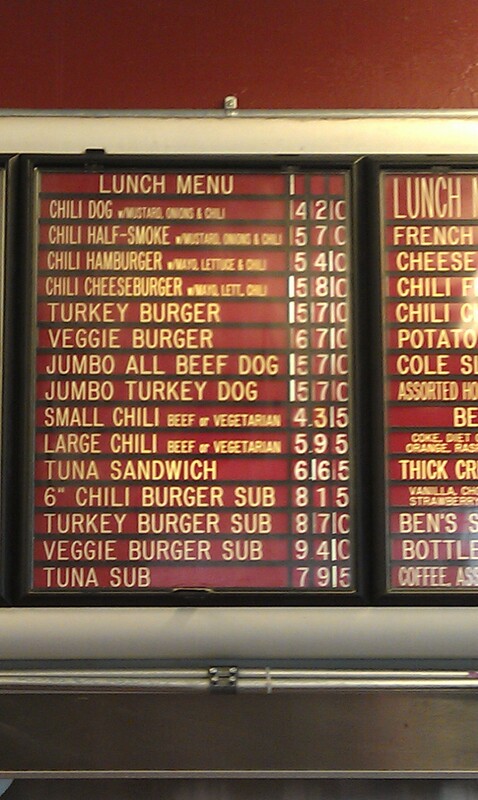 Ben’s Chili Bowl in Washington, D.C., consistently makes the list of must-eats for D.C. but I have never gone. Travel all the way to D.C. for a hot dog stand? I love hot dogs, but I don’t consider them a main event. Hot dogs are the kind of things you eat when you’ve been at a barbecue all day and are peckish but not hungry enough for another hamburger. I wondered if Ben’s was to D.C. what Blondie’s was to the East Bay — just a nostalgic memory suspended in time. But, they DO keep making the Must-Eat lists, so…let’s give it a whirl. I trekked out the the NW (D.C. addresses are divided into quadrants) on a beautiful September day to experience this hot dog mecca. And it was good. 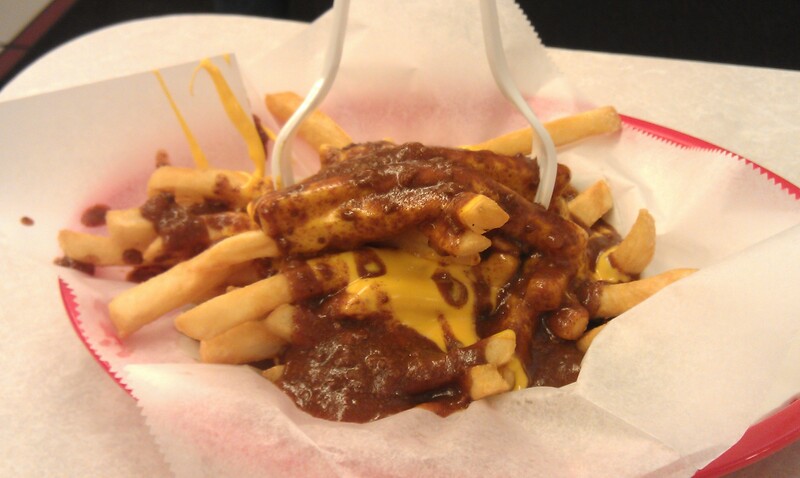 I had the Original Chili Half-Smoke, Bill Cosby’s favorite, and an order of the Chili-Cheese Fries (I swear I wouldn’t normally order these both in one sitting, but I wasn’t driving all the way back out there just for chili fries so I took one for the (blog) team and thought about the long, heart-healthy treadmill session I’d be doing to make up for it). 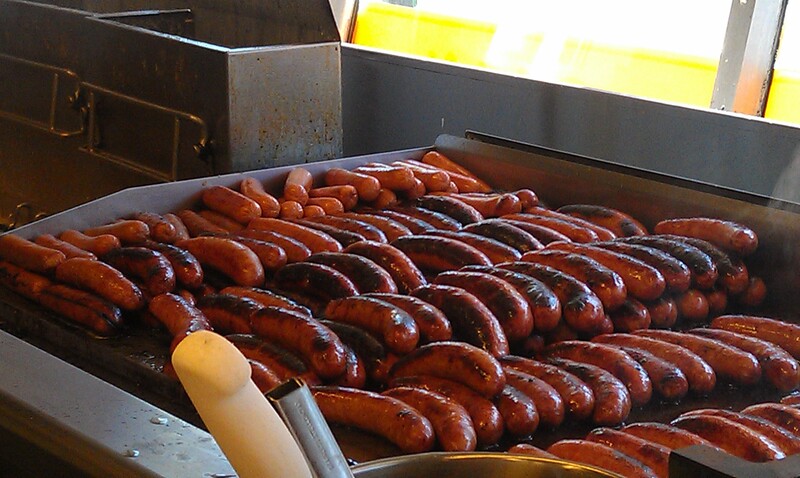 There was a long line (which boded well) but the good thing about that is that I had plenty of time to stare at the the hot dog griddle, which was lovely. My half-smoke was quite tasty, as were the chili-cheese fries, and if I were in the area I would definitely go back for some good grub. Plus, I have to say the employees were SUPER nice. I think that might have impressed me most of all, actually — they were so polite and professional even though the place is very casual and was crazy crowded. The manager even came by our table to see how things were going! Nicely done, Ben’s. I can see why Ben’s holds onto its place in the hearts of D.C. locals. There’s nothing like a hot dog to make you feel young again. I still think of them as street snack food, like when you grab one from a street cart in Manhattan, but when a chili dog is done right it really hits the spot. Makes me want to check out this local place I’ve driven by for years but never gone to…here I come, Ann’s Dari-Creme… I hear they do a mean fried hot dog. Year Two Begins: Of Preferments and Degas. School started two weeks ago. I’m taking three classes and teaching two. Of the classes that I need and am taking right now for my Culinary Arts Entrepreneurship Certificate, two are business related (Small Business Accounting, and Legal Issues for Small Businesses), and one is culinary: Intermediate Breads. One of the textbooks we are using for this breads class is Peter Reinhart’s The Bread Baker’s Apprentice and, so far, it is fantastic. In preparation of the first day of class, I downloaded and printed all the syllabus material so I could read through it and set up my binder with all the necessary tabs and sections. Yes, I am that kind of student. So, I’m making my HRM -124 Intermediate Breads binder and as I skim around the assignments and such I keep seeing this word “preferment” as in, “add your preferment.” The first time I saw it, I noted it as curious – a preferment. Hmm. Then I saw it again: “preferment” and again I wondered about it in my mind, “Hmmm,that’s interesting. A preferment. Something which you prefer. I wonder what that means — nuts? poppy seeds? baker’s choice? Hmm. ” I like words and I think about words a lot — I am an English teacher, after all — so let’s just say I gave it some idle thought as I got my materials ready. Preferment. Day One arrives. We start going over the syllabus. Chef begins talking about yeast, and the fermenting process. Reading this, you’ve probably already figured it out, but not me, not yet. It took several more minutes of class lecture for it to finally — finally — dawn on me: it wasn’t “preferment,” it was “pre-ferment” – something you use to improve the fermenting process. Ugh. I actually started laughing in class and told my neighbors, who looked at me strangely (already marking me as weirdo, I’m sure. Sigh). To be fair, the word as written in the materials lacked hyphenation, and its un-hyphenated form is a word in its own right, so I kept reading it literally and thinking it must be some kind of baking lingo. The funky spelling of this threw me off the scent for years. It was years — years, and I’m not kidding — before I realized the Chick-Fila, the fast food chicken restaurant — was pronounced “Chick Fillet.” Every time I saw the sign I read it just as written, which sounds, to me, like “Chick Feel-a.” And I never understood why they would name it Chick Feel-a. No kidding. But I don’t feel bad about this because I think intentionally misspelling words for effect is dumb — you, too, Krispy Kreme, no matter how good your donuts are. Would it have killed you to spell it correctly, Krispy Kreme? Fast forward to Week Two. Of course I’ve read over all the recipes before class noticing that in one of the recipes (or, “formulas” if you want to be cool) you are meant to “degas it as little as possible.” Hmm. 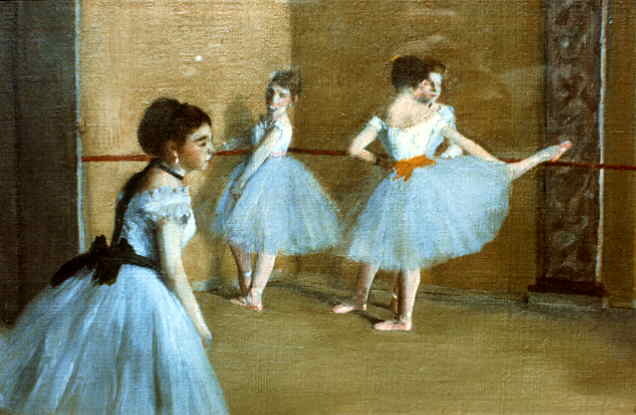 Degas. What style is that? Some French technique we haven’t learned yet, I guess, but I don’t take the time to look it up in the glossary since I am in a hurry. It wasn’t until I was IN LAB ACTUALLY MAKING THE DOUGH that I put it together. Like an actual lightbulb going on overhead. I told my lab partner, who was a cool enough chick to think it was funny, too, and we had a good laugh. Ah, baking lab. What a kick. For those of you other super-literalists out there like me, if there are any, to “degas” is to de-gas. Not French at all.